Bitter Melon is known as Karela, Momordica Charantia, and Cerasee in various parts of the world. 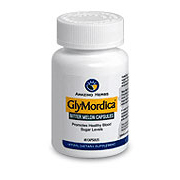 Promotes healthy blood sugar levels. Supports healthy pancreas. Use as part of a healthy diet to help maintain healthy blood sugar levels. In order to preserve the plants full range of constituents, Theramune Nutritionals GlyMordica is made from the whole fruit unlike other products on the market. As a dietary supplement: One to two capsules daily, with water, after meals, as needed. GlyMordica Bitter Melon is shipped in a discrete, unmarked package. Orders are processed immediately and usually take about 3 to 5 working days to be received. We do ask that you try it for 2 to 3 weeks to feel the full effects. Any information received is used only for order processing and shipping purposes. Your information, such as e-mail address, will never be disclosed to a third party.